The Pet Health Record Template is the perfect tool for all pet owners. Whether you have a dog, cat or parrot, you are likely to visit the veterinarian up to three times a year, depending on the age and health of your pet. By using this tool, you are always in possession of your animal’s history, and are fully capable of delivering the required information to the veterinarian should health issues ever arise. What’s more, you can print as many copies as you’d like and never worry about misplacing important information. 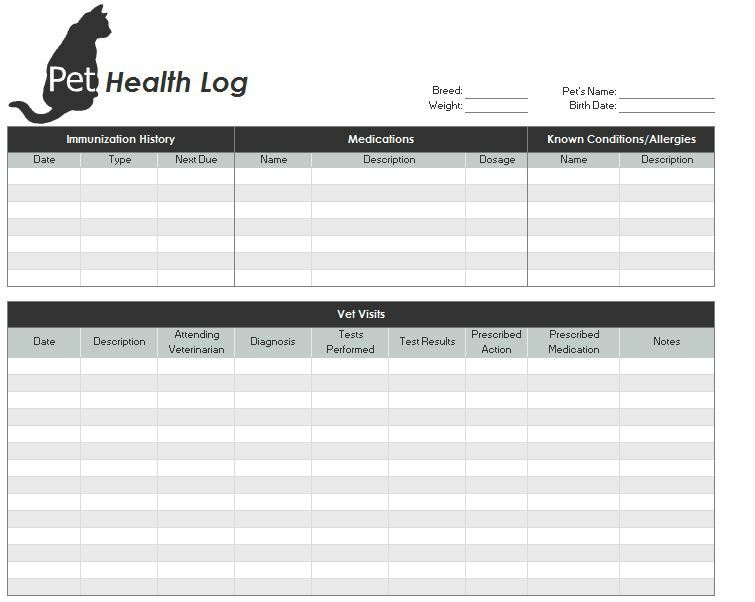 If you download the Pet Health Record Template from this page, it is available for free and within seconds you can access it through Microsoft Excel. This template is so easy to use, you don’t have to be an expert with Excel or any Microsoft Program. You can also customize each chart and column to fit your pet’s specific needs, all with the click of a button. Firstly, the Pet Health Record Template asks you to fill in the breed, weight, name, and birth date of your pet. The more information you can fill in, the easier it is to remember your pet’s information and ensure it gets the best service from the vet. Secondly, the template asks for data concerning immunization, medication, and condition/allergy history. Simply fill in as much information you can within the given slots for future reference. Thirdly, the last section asks for vet visit information. Fill in known dates, what was treated, the veterinarian’s name, diagnosis proscribed, any given tests, medicine received, and any other important information. With these steps, your Pet Health Record Template is complete and ready for print or duplication. Depending on the age of your pet, you may need to add extra rows and columns to a given category. This cam be done by dragging a column downwards. You can maximize a row by dragging the number of the row, located on the left of the page. It’s good to print up to five copies of your pet’s record, but it’s recommended to keep a copy on the computer for future updates. Here, you can highlight important or past visits in red and make future appointments in bold.